Pioneer Tours specialise in creating truly personalised tour programs, matching your interests, budget and the time you have available for your journey. When it comes to creating high quality, authentic Kodaikanal tour program we sincerely believe we are amongst a small group of people capable of the task. 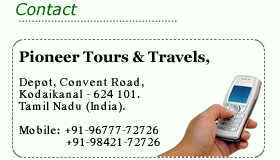 Pioneer Tours & Travels , is a proactive travel organization in Kodaikanal for the last 10 years, started by Mr.A.Sulthan. Transaction level operations are executed by a team of professionally qualified professionals, who are well versed with the complexities of Travel & Tourism Trade. The team is well aware and equipped to cater to requirements of various market segments and understands the nuances of tourism in Kodaikanal. pioneertours.in is an extension of our travel initiative providing the travelers interested in visiting Kodaikanal, all travel services under one roof. How better to plan your Kodaikanal vacation than with a Kodaikanal travel agent who can create a personalised tour programs tailored to your needs? Whether it be a Luxury Kodaikanal vacation or an all out Kodaikanal adventure, we can create the perfect holiday for you incorporating our Kodaikanal Accomodation recommendations. Alternatively, you may like to travel as part of a guided Kodaikanal tour, or if you are seeking the independence that a Kodaikanal hotel or Kodaikanal rental car provides, we can find the best match for you. Copyright @ Pioneer Tours and Travels, Kodaikanal. Website designed & maintained by Nanotech Web Solutions India Private Limited. pioneer tours and travels kodaikanal, kodaikanal pioneer tours and travels, pioneer tours kodaikanal, pioneer travels kodaikanal, travels in kodaikanal, kodaikanal travels, tour operators in kodaikanal, kodaikanal tour operators, car operators in kodaikanal, kodaikanal car operators, rental cars in kodaikanal, kodaikanal rental cars, www.pioneertours.in, pioneeer tours india, pioneer tours kodaikanal, kodaikanal pioneer tours, kodaikanal, kodaikanal tamilnadu india, Kodaikanal Tamil Nadu India, hill station kodaikanal, koadikanal hill station, honeymoon package kodaikanal, kodaikanal honeymoon package, honeymoon kodaikanal, kodaikanal honeymoon, honeymoon package kodaikanal, kodaikanal honeymoon package, cars in kodaikanal, kodaikanal cars, cars kodaikanal, kodaikanal india,india kodaikanal.